Gayle is a Shaman who is following the prophecy of the return of White Raven, bringing hope to the world. She has many traditions within her bloodline allowing her to tap into ancient wisdom by following Spirit guidance. Through her stories of... personal spiritual experiences she awakens hope within all the hearts that she touches. Level: These labs will take you to the next level of self therefore no experience is required and even the most advanced will shift to their own next level of self. We never stop learning and never stop growing. Awareness is never ending I merely increase the tools available to you on a deeper level. 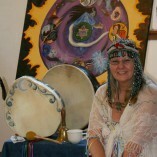 Spirit of the Drum workshop is for those wishing a deeper understanding of their drum. This gathering is for those wishing to go the next level of understanding and find the missing pieces of their puzzle.